Sleater-Kinney drastically changed course on 2005’s The Woods, shifting from punk to something more akin to overdriven classic rock. That move was commendable not only for its boldness, but also for its successful execution. 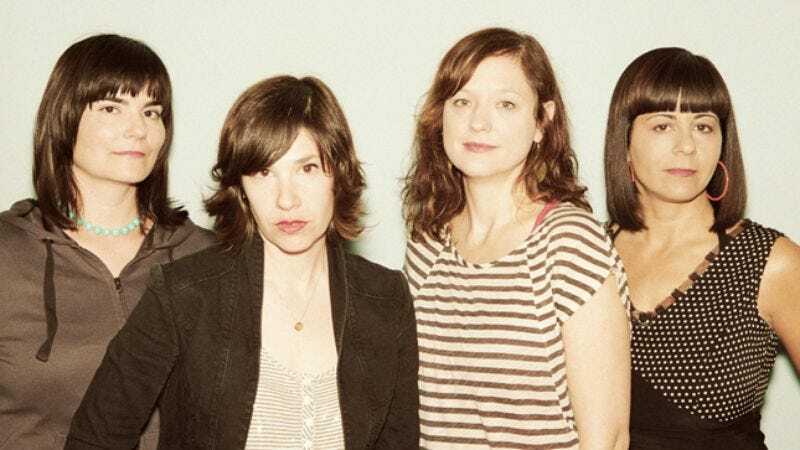 The band broke up the following year, with only drummer Janet Weiss making a quick transition to another group (Stephen Malkmus And The Jicks); guitarist-vocalist Corin Tucker didn’t re-emerge until this year, when she released a solo album; and Wild Flag marks the return of guitarist-vocalist Carrie Brownstein. But it’s hardly the Brownstein show. Wild Flag features a lineup of indie-rock all-stars, including Weiss on drums, Mary Timony (Helium) on guitars and vocals, and Rebecca Cole (The Minders) on keys and vocals. In spite of the pedigree, Wild Flag doesn’t stray far from the path set by The Woods. Near the beginning of the excellent opener, “Romance,” the fuzzy guitars bounce from channel to channel (like the end of The Woods’ “Let’s Call It Love”), and the jammier parts of “Glass Tambourine,” “Racehorse,” and “Black Tiles” would fit on the album as well. The guitars at the beginning of “Something Came Over Me” recall Sleater-Kinney pre-The Woods, with Timony’s voice even sounding like a subdued Corin Tucker. The vocal harmonies created by Brownstein, Weiss, Cole, and Timony will sound familiar to S-K fans as well. That said, Wild Flag doesn’t feel like a retread, in part because Cole and her organ provide another sonic layer. It’s the extra hook in “Boom,” it adds tension in “Future Crimes,” and it generally helps Wild Flag’s sound cohere. The sharp-tongued Timony has led a band or worked as a solo artist for two decades, and her presence shouldn’t be underestimated, either. The album also has a confidence that comes from working the songs out on the road, recording live in the studio, and the band members’ inherent chemistry. Considering the personnel involved, it’s no surprise Wild Flag works as well as it does, or that it picks up in a familiar place. It’s just nice when a super-group actually lives up to the title.